Continuing from the first moon landings were not a hoax. Here's a link to the first part of the debate, for reference. 1. 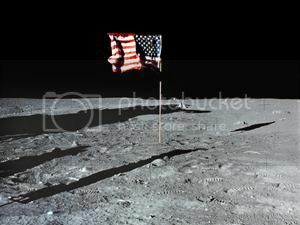 "In the picture released by NASA following the Apollo 11 launch, you can clearly see an astronaut saluting an American flag, which appears to be fluttering in the breeze. Unfortunately for the Government, there is no flag-fluttering breeze on the moon. There is, in fact, no atmosphere." According to NASA "Not every waving flag needs a breeze -- at least not in space. When astronauts were planting the flagpole they rotated it back and forth to better penetrate the lunar soil. So of course the flag waved! Unfurling a piece of rolled-up cloth with stored angular momentum will naturally result in waves and ripples"
2. Non-Parallel shadows: The mythbusters tried this one here what happened; "The MythBusters built a small scale replica of the lunar landing site with a flat surface and a single distant spotlight to represent the Sun. They took a photo and all the shadows in the photo were parallel, as the myth proposed. They then adjusted the topography of the model surface to include a slight hill around the location of the near rocks so the shadows fell on a slope instead of a flat surface. The resulting photograph had the same shadow directions as the original NASA photograph from Apollo 14. To test this, they built a much larger scale (1:6) replica of the landing site, including a dust surface with a color and albedo similar to lunar soil. The MythBusters then took a photograph which was nearly identical to the original NASA photo from Apollo 11. The MythBusters explained that the astronaut was visible because of light being reflected off the Moon's surface." 3. "As you probably know, the sun is very, very far away from the moon. So far, that two objects of approximately equal height, about a foot apart from each other, should have shadows of approximately equal length. So check out this photo. First of all the distance is more than 1 foot. From the photo it appears to be about 6 ft based of of the astronauts height. Second of all like above the moons odd surface, lack of atmosphere, and color can cause shadows to act differently than on Earth. 4. the "C" rock. Take a look here http://www.moonlandinghoax.org... It's very interesting. 1. And, as you can clearly see, the Astronaut was saluting the flag, not unfurling it. That does like a bit of a bullsh*t answer, considering the fact that NASA said that after the pictures were published. After they realized their mistake. 2. Well, if the Mythbusters say it, it must be true. I mean, it's on TV for gods sake. In keeping with true conspiracy-theorist thinking, Alan and Jamie were probably paid by the government to falsify a science experiment. 3. "like above the moons odd surface, lack of atmosphere, and color can cause shadows to act differently than on Earth." But not that differently. The photo was clearly taken from above, on fairly flat ground, with what is either a camera crew or a robot arm holding a camera. You don't actually have evidence to support your opinion, not even Mythbusters pseudo-science. 4. What I read on this page doesn't actually debunk the C rock claim. It just says it was a hair that NASA digitally removed. It also claims the picture is a "third generation copy", which is a nice idea but utterly meaningless without records. NASA could just of easily removed a stage marker from the rock, destroyed the original picture, and presented the nice, clean image to the public. I, Nerd in a Trenchcoat, declare the debunks debunked! Look at these photos. See anything strange? The Astronauts are on the moon, a place with no atmosphere. No atmosphere means nothing to block the starlight. Why aren't there any stars in these pictures? I'll leave you to ponder on that. Peace. "And, as you can clearly see, the Astronaut was saluting the flag, not unfurling it. That does like a bit of a bullsh*t answer, considering the fact that NASA said that after the pictures were published. After they realized their mistake." Actually because of the lack of an atmosphere tha flag can continue "waving" for quite some time after. "Well, if the Mythbusters say it, it must be true. I mean, it's on TV for gods sake. In keeping with true conspiracy-theorist thinking, Alan and Jamie were probably paid by the government to falsify a science experiment." Con appears to be claiming that the Mythbusters are not a reliable source; however I would like to remind readers that mythbusters is on the discovery channel which also produces documentaries funded by the National Science Foundation. Con also claims the government paid them to falsify the evidence; however there is no evidence that the government did such a thing; hence this claim is unwarranted. "like above the moons odd surface, lack of atmosphere, and color can cause shadows to act differently than on Earth." Anything that can make normally parallell shadows unparallell certainly does make shadows act "that differently. "Anyways cons only argument against it is that the terrain, color, and dust on the moon couldn't make the shadows different sizes, but con doesn't have any evidence that this wouldn't happen; so I'm going to call occams razor since if it's a conspiracy you have to assume 1. there is a conspiracy; and 2. NASA is stupid enough to make such a terrible mistake; so natural caues require many less assumptions. Con claims in the second part that myth busters is pseudoscience; here is the definition of pseudoscience: Pseudoscience is a claim, belief, or practice which is presented as scientific, but does not adhere to a valid scientific method, lacks supporting evidence or plausibility, cannot be reliably tested, or otherwise lacks scientific status. Mythbuster does not pertain to any of these criteria; hence it is not pseudoscience. "What I read on this page doesn't actually debunk the C rock claim. It just says it was a hair that NASA digitally removed. It also claims the picture is a "third generation copy", which is a nice idea but utterly meaningless without records. NASA could just of easily removed a stage marker from the rock, destroyed the original picture, and presented the nice, clean image to the public." What proof does con have of it not being a third generation copy. Also NASA does have the original photographs. On the claim of no stars, here is a quote from wikipedia on it. "There are no stars in any of the photos; the Apollo 11 astronauts also claimed in a post-mission press conference to not remember seeing any stars. The astronauts were talking about naked-eye sightings of stars during the lunar daytime. They regularly sighted stars through the spacecraft navigation optics while aligning their inertial reference platforms. All manned landings happened during the lunar daytime. Thus, the stars were outshone by the sun and by sunlight reflected off the Moon's surface. The astronauts' eyes were adapted to the sunlit landscape around them so that they could not see the relatively faint stars. Likewise, cameras were set for daylight exposure and could not detect the stars. Camera settings can turn a well-lit background to black when the foreground object is brightly lit, forcing the camera to increase shutter speed so that the foreground light does not wash-out the image. A demonstration of this effect is here. The effect is similar to not being able to see stars from a brightly lit car park at night—the stars only become visible when the lights are turned off. The astronauts could see stars with the naked eye only when they were in the shadow of the Moon. Photos of the solar corona that included the planet Mercury and some background stars were taken from lunar orbit by Apollo 15 Command Module Pilot Al Worden"
I have debunked cons debunked debunks. Con has forfeited and so logically cannot find any flaw in my logic or sources. I have provided undeniable evidence of the moon landings and have proven that there is nothing to the conspiracy theoies.